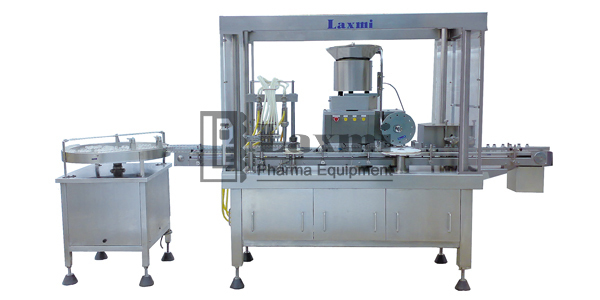 LAXMI Automatic Volumetric Liquid Vial Filling & Stoppering (Full & Half bunging) Machine. The Basic Unit Consists Of One Or both side Turn Tables, S.S. Slat Conveyor Belt, Unique Co- eccentric Simultaneous Gassing with Filling. The Machine Is And Can Be Run Totally Through Touch Screen HMI, PLC Control And The Machine Is Based On Servo Motor Drive, Being The Stoppering Of Rubber Bungs Is Carried Out With The Help Of Vacuum Air Pressure. The Main Characteristics of the Machine Is That the Volume Can Be set On the Touch Screen HMI within a two second. The Machine Has an Output Speed of 200 Vials per Minute but Depending upon the Fill Volume and Container Dia. /size Or the Quality & Viscosity of Liquid. Input (Container Dia/ Height) 16mm Dia to 50mm Dia/ Height 75mm Max.